Skip the stress of travel on an all-inclusive Grand Canyon tour with helicopter and boat ride upgrade options. After pickup from your Las Vegas hotel, board a custom-built SUV equipped with plush leather captain’s chairs and extra-large viewing windows. 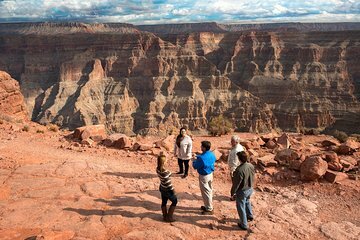 As your small group sets out on a full day of exploring the Grand Canyon, you'll visit Boulder City and travel over the Hoover Dam bypass bridge on the way to the Grand Canyon. Upgrade your tour for the opportunity to explore Hoover Dam with a guide. Drive along Diamond Bar Road (Indian Highway) through the Grand Wash Cliffs and the stark beauty of Joshua Tree Forest. Arrive on the West Rim of the Grand Canyon to board your waiting helicopter (if option selected). Admire the spectacular scenery as the helicopter descends 4,000 feet (1,200 meters) to the Colorado River below during the course of the flight. On the banks of the mighty Colorado River, you can opt to board a pontoon boat for a leisurely cruise. Listen to informative commentary along the way. Return to the top of the canyon and spend a few hours exploring at your own pace. Take advantage of the complimentary shuttle service to Hualapai Ranch, Guano Point and Eagle Point. Learn about Native American culture through a stroll in the Indian Village at Eagle Point. Visit Guano Point for great views of the Colorado River. 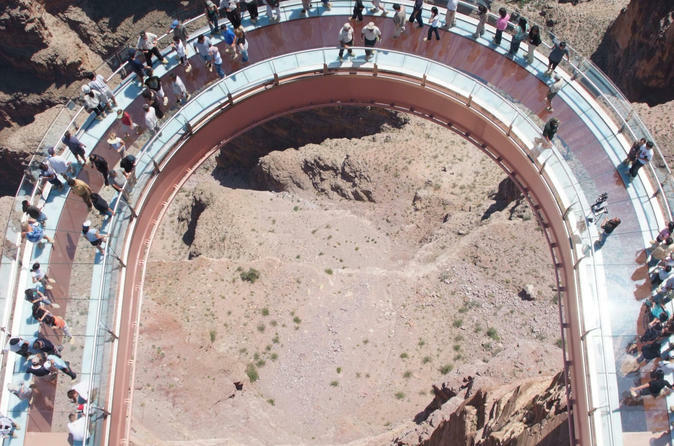 Stroll the Grand Canyon Skywalk (own expense) to get unobstructed views of the Canyon. Your tour ends with drop-off at your hotel in Las Vegas. Absolutely AMAZING trip! Perfectly organised, the lovely lady Debbie who hosted was FABULOUS. It was a small group of 10, the trip there/back was 2 1/2 hours in a very comfy SUV. Debbie kept us entertained the whole way with her extensive knowledge. The helicopter with Sundance was just incredible, lunch at a local ranch, great boat trip, skywalk, then we stopped briefly at the Hoover Dam on the way back. This really is a MUST DO....not cheap, but worth every penny. Highly recommended. A long and tiring day but brilliant. A very knowledgable driver who didn't stop giving you information all day. Helicopter ride down to the canyon floor was awesome as was the boat ride. Highly recommend. Our tour guide, Debbie, was very knowledgeable, flexible and a lot of fun. The vehicle was very comfortable. Movie on the way back was a neat way to see one of the sights in another way. Just wish our helicopter pilot has provided some narration during our flights. We had the most fantastic experience doing this tour with Pink Jeep- Jeff the driver and Sundance helicopter tours. Everything was spot on from pick-up, history of Las Vegas, Hoover Dam, Helicopter ride down to the canyon breathtaking ride on boat on Colorado Riverexhilarating, helicopter ride up the canyonagain breathtaking, lunch at Walapai Ranch,Grand Canyonawesome, Guano Point, cool bottled water for journey, comfort stops along the way. DO THIS TOUR. NO REGRETS! It was just a bit deceiving in reference to being on the Luxury SUV, it was not for the main portion of the Grand Canyon. You had to board a large coach along with a lot of other people. If that had just been stated in the ad I would have been fine, but definitely let down by this aspect of the tour. Everything else was great. Very knowledgeable guide, boat ride was short but good, and the helicopter ride was AWESOME! In a word: excellent. Our tour guide Chris was friendly, helpful and a mine of information. He was ahead of time to pick me up and on the way to the West Rim we stopped at the Hoover Dam to take pictures. Bottled cold water was available throughout and there were bathroom breaks so no need to worry about keeping well hydrated! both some fairly fast stretches which were exhilarating and sometimes a bit damp!, but also very slow sections so we could enjoy the peace and grandeur of the canyon. All too soon it was time to aboard the helicopter for the return leg which was just as amazing. I'll not for get that day and thanks to Chris, Pink Jeep Tours and Sundance Helicopters. Excellent tour from start to finish. Pick up was in a nice roomy minivan, or luxury SUV as they describe. Driver was very informative and gave us lots of great narration about the areas we were travelling through and all about the Grand Canyon and how the West Rim came to be. We arrived around 30 minutes before the crowds and did the helicopter ride without a wait. An excellent experience and my wife was not looking forward to the helicopter ride as she has a fear of flying, but really enjoyed the trip and views. We landed by the Colorado River and then took the boat ride. In a perfect world would have liked a longer boat ride not an option I am aware of but it was still ample to see the Colorado River and the view from the bottom of the Canyon to the Rim. We then got back in the helicopter and took a different route back to the landing zone. As we got back the queues for the helicopter rides were much bigger and up to a thirty minute wait. Then it was off to the area where the Skywalk is and some great views and we did the Skywalk to. On the way back we went via the Hoover Dam. We got to drive over it and then we stopped above it for some photos. Great day all in all and highly recommend. A must do tour . Fantastic guide, lunch included was excellent water included all day . Tour includes hoover dam stop and time to take photos, refreshment/toilet stop in a little American town/settlement which was amazing to see and the Grand Canyon was Fab, the helicopter flight down to and out of canyon was amazing felt very safe and secure and the boat ride up the river is a must to see the canyon from below , loads of photo opportunities and a chance to go on the skywalk if you want to , a thoroughly amazing site not to be missed. I love this tour.. the helicopter ride was amazing, the best experienced I ever had. It was a small group of 6 with a very knowledgeable staff I forgot his name, sorry. He was very nice, funny and knows his things. We don't feel rush at all, in fact we feel like we had so much time with all the stops we made. It was the best experience everyone must try.